Earlier this year, we decided it was time to move house (as we needed more room) and although it was exciting, it was pretty stressful too! 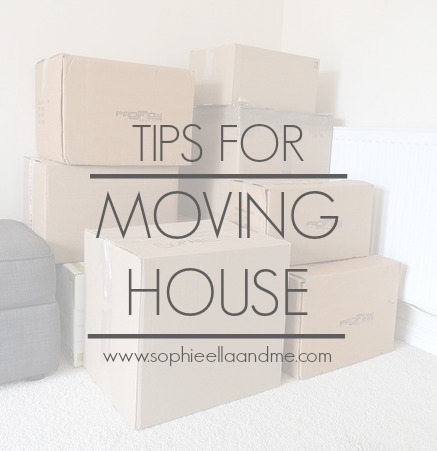 I thought I would put together some tips, which you will hopefully find useful if you're also planning on moving house in the near future. I make lists for just about everything anyway, mainly because I'm so forgetful but it also means I have everything I need to do written down, so I don't forget anything important. I created a spreadsheet of all of the bills that needed changing, gas and electric, water, house insurance, just to name a few. I also made a separate list of places I need to change our address, doctors, dentist, benefits, banks and driving licences. It's very time consuming but it has to be done! I started packing items we didn't really use or need, so items like winter clothes, spare bedding and non-essential items, all went in boxes out of the way. Don't forget to label each box with the specified room to make things easier when moving day arrives. I had a good sort through of everything we didn't need and either sold them on eBay or local selling sites. Some items I took to the charity shop and if they were no good, they went to the tip. It meant less clutter.. and less stuff to move! Make sure you hand in your notice in plenty of time. We also needed to put the house back to how it was when we moved in, which meant taking photos down and filling in holes etc and painting Sophie's room back to magnolia. We also did a few touch ups where needed. If you're using a removal company or hiring a van to do it yourself, don't forget to book in plenty of time. It's one less thing to worry about! You could maybe ask one of your family members or a friend if they could kindly watch your child/children while you move. It means you can get everything done faster without any distractions and/or worrying about entertaining, feeding, changing them etc!